It’s been a whole week since I last spoke with you all. My excuse is that I came down with a major head cold that stopped me in my tracks. My ears are still echoing but I’m through the worst of it I hope. It happened when we went from warm sunny days to immediate overcast and rain showers. And this day of weaning our calves on the mountain probably didn’t help much. I was in the pickup so I didn’t get too wet during the gather. But with assistance from some cowboys and cake (mineral snacks for the cows), we had a successful gather. It was just a cool mist during the first hour of the gather but as soon as we got to the corrals, it was really raining. The cowboys separated the cow mommas from the grown calves. Mommas peered through the fence while I guarded the gate. Calves called out for momma…. …and momma called out for baby. This is my least favorite part of ranch life but it’s part of it. The calves are physically ready to leave momma but not emotionally. They never are. Neither am I. As we left with the trailer load of calves, the rain was really coming down. Then it rained for the entire week. This was two weeks ago and we weren’t able to bring the cow mommas off the mountain until this past weekend. The roads were muddy and washed out and the trailer wouldn’t have made it. As of this weekend, we are all home and are gearing up for winter. The cows are successfully bred and they’ll have their new babies in the spring. Looking forward to our first winter on our new ranch. Thanks for sharing and do feel better! I love what you call getting all the cows together; “The Gather” (the caps give it the respect that it seems to need in the course of this comment). It sounds like a movie title—which could be for both feel-good movies and horror stories. 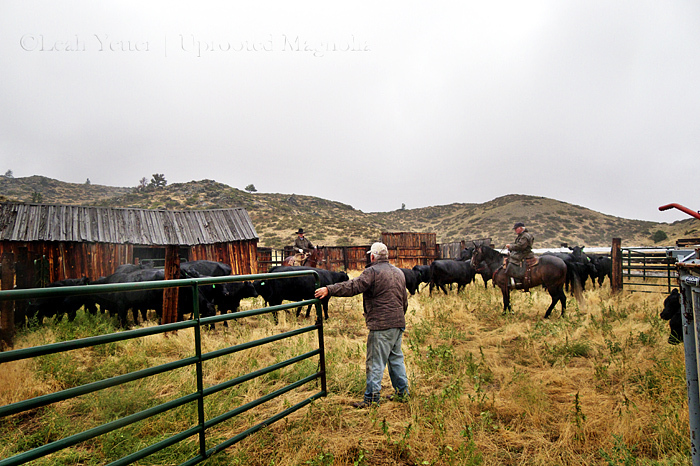 Thanks for sharing a true Wyoming cattle ranch experience!